This article is about the primordial buddha Vairocana. For the Tibetan translator, see Vairotsana. A gilt-bronze statue of Vairocana Buddha, one of the National Treasures of South Korea, at Bulguksa. Vairocana (also Mahāvairocana, Sanskrit: वैरोचन) is a celestial buddha who is often interpreted, in texts like the Avatamsaka Sutra, as the dharmakāya of the historical Gautama Buddha. 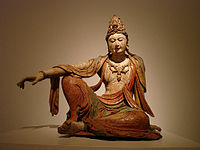 In Chinese, Korean, and Japanese Buddhism, Vairocana is also seen as the embodiment of the Buddhist concept of Śūnyatā. In the conception of the Five Tathagatas of Mahayana and Vajrayana Buddhism, Vairocana is at the centre and is considered a Primordial Buddha. Vairocana is not to be confused with Vairocana Mahabali, son of Virochana. He is also mentioned in the Avatamsaka Sutra; however, the doctrine of Vairocana is based largely on the teachings of the Mahavairocana Tantra (also known as the Mahāvairocana-abhisaṃbodhi-tantra) and to a lesser degree the Vajrasekhara Sutra (also known as the Sarvatathāgatatattvasaṃgraha Tantra). He is also mentioned as an epithet of Gautama Buddha in the Samantabhadra Meditation Sutra, who dwells in a place called "Always Tranquil Light". Vairocana is the Primordial Buddha in the Chinese schools of Tiantai and Huayan, also appearing in later schools including the Japanese Kegon, Shingon and esoteric lineages of Tendai. In the case of Shingon and Huayan, Vairocana is the central figure. In Sino-Japanese Buddhism, Vairocana was gradually superseded as an object of reverence by Amitābha, due in large part to the increasing popularity of Pure Land Buddhism, but Vairocana's legacy still remains in the Tōdai-ji temple with its massive bronze statue and in Shingon Buddhism, which holds a sizeable minority among Japanese Buddhists. [T]here is the realization that Amida is the Dharmakaya Buddha, Vairocana; then there is the realization that Amida as Vairocana is eternally manifest within this universe of time and space; and finally there is the innermost realization that Amida is the true nature, material and spiritual, of all beings, that he is 'the omnivalent wisdom-body, that he is the unborn, unmanifest, unchanging reality that rests quietly at the core of all phenomena". Helen Hardacre, writing on the Mahavairocana Tantra, comments that Mahavairocana's virtues are deemed to be immanently universal within all beings: "The principle doctrine of the Dainichikyo is that all the virtues of Dainichi (Mahāvairocana) are inherent in us and in all sentient beings." With regard to śūnyatā, the massive size and brilliance of Vairocana statues serve as a reminder that all conditioned existence is empty and without a permanent identity, whereas the Dharmakāya is beyond concepts. 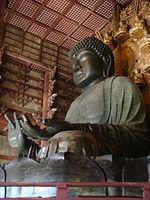 The Daibutsu in the Tōdai-ji in Nara, Japan is the largest bronze image of Vairocana in the world. The larger of the Buddhas of Bamiyan in Afghanistan that were destroyed was also a depiction of Vairocana. In Java, Indonesia, the ninth-century Mendut temple near Borobudur in Magelang was dedicated to the Dhyani Buddha Vairocana. Built by the Shailendra dynasty, the temple featured a three-meter tall stone statue of Vairocana, seated and performing the dharmachakra mudrā. The statue is flanked with statues of the bodhisattvas Avalokiteśvara and Vajrapani. The Spring Temple Buddha of Lushan County, Henan, China, with a height of 126 meters, is the second tallest statue in the world (see list of tallest statues). Vairocana with Avalokitesvara and Vajrapani. 9th century, Indonesia. The Great Buddha of Tōdai-ji, at a Kegon Buddhist temple in Nara, Japan. The Great Buddha of Hyōgo. Kobe, Hyōgo, Japan. ^ "Birushana Buddha. SOTOZEN-NET Glossary". Retrieved 2015-09-12. ^ Buswell, Robert Jr; Lopez, Donald S. Jr., eds. (2013). Princeton Dictionary of Buddhism. Princeton, NJ: Princeton University Press. pp. 949–950. ISBN 9780691157863. ^ "YMBA's translation of Brahma Net Sutra". Archived from the original on March 5, 2005. Retrieved 2008-12-12. ^ Francis Xavier and the Land of the Rising Sun: Dainichi and Deus, Matthew Ropp, 1997. ^ Elisonas, Jurgis (1991). "7 - Christianity and the daimyo". In Hall, John Whitney; McClain, James L. (eds.). The Cambridge History of Japan. 4. Cambridge Eng. New York: Cambridge University Press. p. 307. ISBN 9780521223553. Birmingham, Vessantara (2003). Meeting The Buddhas, Windhorse Publications, ISBN 0-904766-53-5. Cook, Francis H. (1977). Hua-Yen Buddhism: The Jewel Net of Indra, Pennsylvania State University Press. Wikimedia Commons has media related to Vairocana.